Above, Pentas lanceolata ‘Lucky Star’, Alternanthera brasiliana ‘Purple Prince’ and Hibiscus rosa-sinensis ‘Ivory Wind’. Below, Petunia x hybrida ‘Colorblitz Glow Blue Stardust’, Phlox ‘Gisele Hot Pink’ and Calibrachoa Neo Pink Strike. All photos courtesy of the developers and introducers. Late last year I wrote here that beginning in mid-January I would continue with my series on new plants for gardens in 2018. Specifically about new annual flowers. Then I did not stay true to my word. Sorry! The first of six annuals I am going to write about this week is a new Pentas or Star-flower. Pentas lanceolata ‘Lucky Star’ is available in five colours plus white. Now I have grown some of the older Pentas for decades and I always liked them because of the continuous blooming and the brilliant colours. Vibrantly colored blooms on lush, full-looking plants are perfect in combinations, containers or landscapes. Reblooms fast so you enjoy a consistent color show all season. Easy care with high durability…Lucky Star makes every gardener look like a pro! This colour-rich series has a tight, compact habit that keeps them looking tidy with virtually no effort. The promise of continuous, show-stopping colour on full, lush plants…now that’s a huge plus! 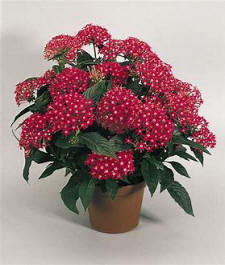 These Pentas grow to a height of 30 – 41 cm (12 - 16") and a width of 30 – 36 cm (12 - 14"). They prefer full sun and medium amounts of water. They attract butter-flies, bees, and Hummingbirds; they are heat tolerant and low maintenance. The second new annual is a plant with which I have had a great deal of experience in the past five decades—it is known as Alternanthera brasiliana ‘Purple Prince’. At the Niagara school we grew thousands of these for use in the various formal bed-ding displays, including of course, the Ontario Hydro Floral Clock, and many displays in the main Queen Victoria Park right at the falls. However, all of those plants were grown in the NPC greenhouses from cuttings—never from seed. Now, they have finally produced an Alternanthera that can be grown from seed! The first compact Alternanthera from seed! Ruby to burgundy foliage. This attractive heat loving foliage plant creates a unique carpet of colour! Great for garden beds, landscapes, and a great addition to mixed containers. 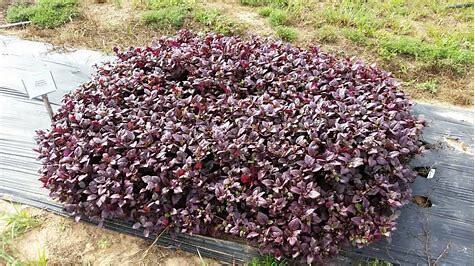 Beautiful burgundy-purple leaves with ruby-rose underside. 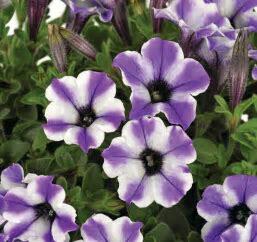 Stands tough in heat and humidity, and has low water needs. Best in full to partial sun. In deep shade, the leaves will be more green. Plant after last frost. Our third plant this week is a tropical Hibiscus—Hibiscus rosa-sinensis ‘Ivory Wind’. The plant has abundant flowers with reduced bud drop; superior branching and compact habit; yellow buds open to creamy white, 12 cm (4.75”) blooms with a deep pink eye. They grow 90 cm (36”) tall by 76 cm (30”) wide. 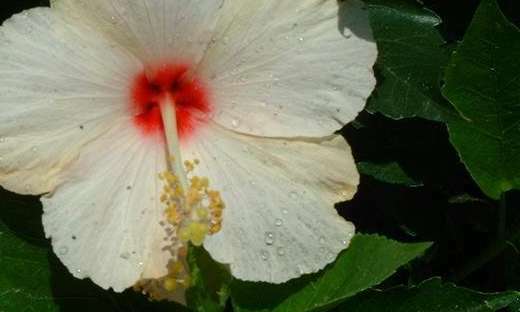 Hibiscus prefer full sun; well-drained planting media; never let plants wilt or stress from lack of water. The fourth new plant is a Petunia with two colours on each flower. Petunia x hybrida ‘Colorblitz Glow Blue Stardust’. 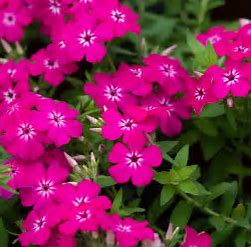 Blossoms into a lush, flower-filled plant that puts on a high-impact show all season long with very little attention. Medium-vigour series is well-suited for gallon and larger production. The colours also make great additions to mixed containers, and are best for gallon and 30 cm (12-in.) hanging baskets. They are early flowering. Their growing height is 20 – 25 cm (8 - 10") and the width is 41 – 56 cm (16 - 22" ). The habit is generally described as “trailing”. There are many solid (one-) colour cultivars in the same series and they may easily be mixed and matched in the same plantings because the height and width of growth are the same for both types. My fifth choice for this week is a Phlox—‘Gisele Hot Pink’. This new annual series boasts large flower clusters with continuous colour all season long. Intense colours, heavy blooming and weather tolerance highlight the series. Sure to fill your landscape with colour all summer long. Large hot-pink flower clusters last throughout the summer. Trialed all over North America, Gisele is a top performer across all areas. Great in gardens, continuously producing colourful blooms. Growing height is 25 – 30 cm (10 - 12") and width or spread is 36 – 46 cm (14 - 18"). They much prefer full sun growing conditions as do the aforementioned Petunias. 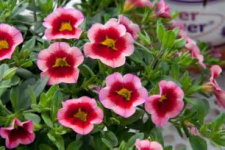 My final pick for your 2018 garden is a lovely coloured Calibrachoa—Neo Pink Strike. Large flowers, early flowering, a semi-trailing habit, medium vigor and the performance that gardeners expect from MiniFamous. For a uniform, semi-trailing habit, along with medium vigour and attractive flowering time, try MiniFamous Neo. It features large single blooms and a wide range of colors. Brings an extra-large (punch-type) eye to the series, along with larger blooms and uniformity to match the series. The average height of these is 25 – 38 cm (10 -15”) and their width or spread is the same. Well there are six new plants for you for this week and all being well, I expect to have another six next time.